Nicky found himself surrendered to a shelter. He is one of those great little guys who didn’t know what he did wrong. We were contacted to see if we had room for this handsome little man and he was welcomed with open arms. 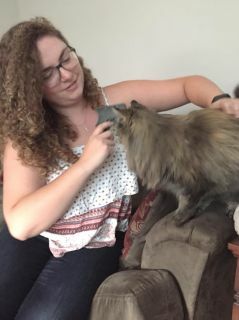 Nicky met his new mom who was anxiously waiting for him to arrive. He was very comfortable and it didn’t take long for him to figure out some tasty treats were all his! 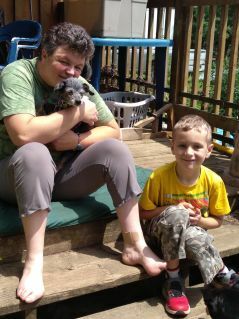 Nicky is going to have a great life, filled with love and no more worries of no longer having his own home. Thanks everyone who made Nicky’s wish come true! 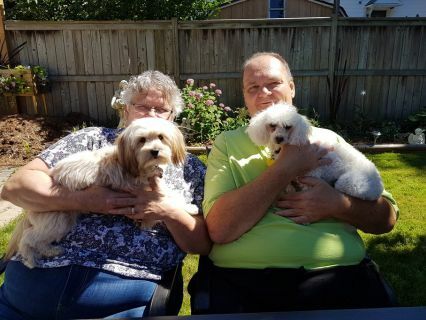 George has happily adjusted to his adopted forever family! 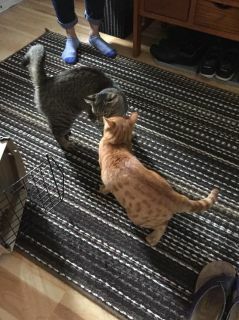 When we arrived for his adoption he walked out of his crate and was greeted by his feline brother Simon! They quickly became best of friends and have been playing almost non-stop. Congratulations to George and his family! Jasper is one sweet happy little senior guy, he loves everybody he meets and insists on greeting everyone who crosses his path. This little guy was found dumped and in poor shape. The people who found him didn’t want him to go to a shelter, they took care of him until one of our rescue friends could take him. Then he made the journey to our rescue. He is Mr. Social Butterfuly, not a mean bone in that little body. Jasper has been patiently waiting for his forever home and today was his special day to celebrate! Thanks to everyone who helped Jasper get his second chance! Frankie is such an adorable little guy, much smaller than he looks in his pictures. He was surrendered along with two little girls to a high kill shelter in Quebec. None of them were going on the adoption floor so it was important they find another option….we were blessed to welcome all 3 into our rescue. Frankie is a quick learner, he just needs some help to gain his confidence. We believe he was used as a breeder and had limited contact with people. 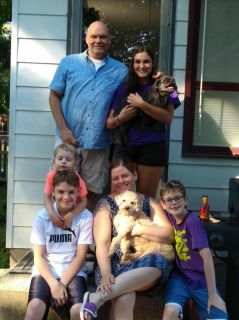 Frankie has hit the jackpot with his new family! He is going to get all the patience and time he needs to learn to trust and be a happy little guy! He bonds quickly and we know he is going to be one very loved little dog! Thanks to everyone who helped Frankie get his second chance at love! This sweet little girl was found tangled in a briar bush by some very kind people. They took her to a shelter who then contacted a friend in rescue who asked if if we could help find a great home….that was an easy question….of course! This little angel is so loving, quiet, enjoys being cuddled and taking little walks. Briar met her new family and she gave her paws up approval and knows she will be treated like the princess she is for several years! Thanks to everyone who helped Briar Rose get her Second Chance! Yoshi came to our rescue through no fault of her own. She is a beautiful soul full of love and affection! Today she found her furever home where she will have undivided attention. 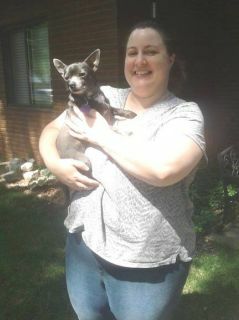 Congratulations to Yoshi and her new Mama!!! Handsome boy Tuuka recently came to our foster program. He is such a sweet boy who loves to be with you and is very cuddly and loving. 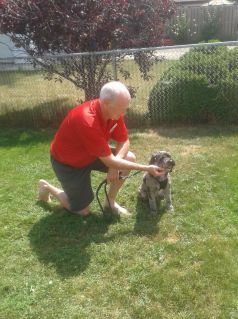 He met his new family and felt very comfortable, enjoyed some tasty treats and decided to stay! 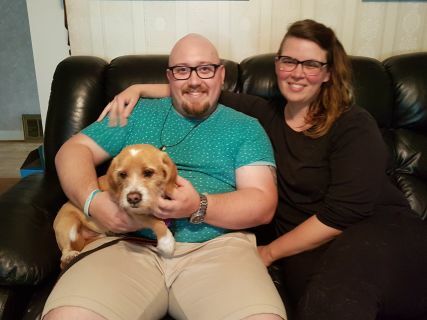 Thanks to everyone who helped Tuuka get his second chance! Tinkerbell was surrendered to a high kill shelter. Sadly this shelter had so many dogs, she was on the list of 40 dogs who had to be out otherwise she would be euthanized with the others. Thanks to a rescue friend, Tinkerbell was pulled to safety and came to our rescue’s foster program a few weeks ago. This little girl is so happy go lucky, sweet as can be and was patiently waiting for her forever family to find her! She met them today and it was a love connection! She is in her glory that she finally has a home to call her own! 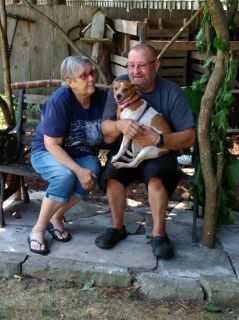 Thanks to the volunteers who helped Tinkerbell get her second chance! Little Dolly came from a breeding situation where she was kept in an outdoor rabbit hutch. Thanks to some friends in rescue she was saved from a horrible life of breeding and came into our foster program. Dolly is a timid little girl, still getting used to living outside a rabbit hutch. She is a quick learner! She met her new family, figured out quickly what a tasty bone was and met her new sister. These two have started chattering with each other and will be BFFs soon if not already! 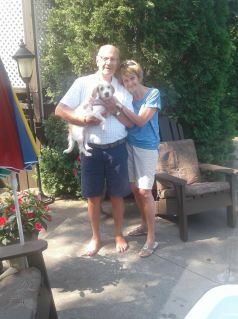 Thanks to everyone who helped Dolly get her Happy Ending! Sweet Sadie was surrendered to a high kill shelter in Quebec with two other small dogs. Sadly, whoever surrendered them didn’t provides names so all of these dogs were starting their lives over. Sadie is a wonderful little girl, so happy and carefree. She was shy initially but has really come out of her shell. She met her new family today and made herself right at home! Thanks to everyone who helped Sadie get her second chance!